D C Miller, David but known on the canals as Dusty, was born in Wimbledon in 1941 and trained under George Mackley RE, one of Britain’s finest wood engravers and at Sutton and Cheam School of Art before being employed as a photographic retouching artist and airbrush illustrator. He always had a fascination for water and developed an interest in waterways while canoeing as a scout. This led to hiring ex-working narrowboats on the Midland canals. There were still several companies operating commercial fleets at this time and Dusty’s interest developed into a passion for these craft and the boatman’s unique way of life with a desire to record as much as possible with brush and paint. 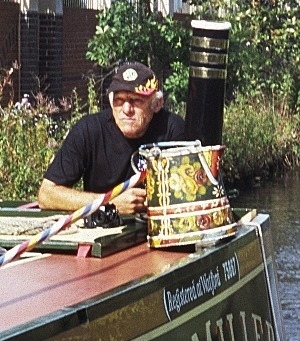 In the early 70′s he moved to Staffordshire and ran a floating studio on a pair of boats, painting, producing pottery and painting boats with traditional decoration before relocating to a lock cottage near Stratford on Avon until becoming manager of hire fleet and boatbuilding company. 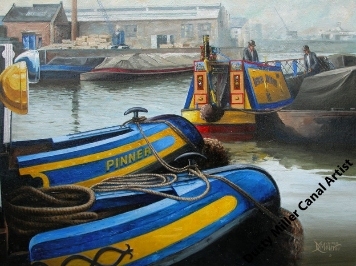 After returning to advertising as a freelance artist artist tackling anything from publicity, book illustration and oil commissions to pub signs, Dusty now paints full time, mainly on oils and on canvas, specialising in waterway scenes although he is happy with other subjects including cars, trains, landscape, animals and the occasional portrait. His many commissions include the illustrations and jacket design for Sheila Stewart’s well known waterway book “Ramlin Rose” and covers for M&M Baldwin’s popular “Working Waterways’ series”, while paintings hang in corporate and private collections in Britain, the Continent and as far away as the United States and Australia.